[Work in progress] Error iii, Graphite on paper, 22 x 30 inches. | Artist: Imran Channa, 2015, Lahore. Issue 10 | Subscribe today! Since 1947, the state machinery of producing myths of origin, and images of “us”and “them” has been chugging away, disseminating, with varying degrees of success, a fabricated, distorted and, at times, absurd version of history which “promotes”the “Ideology of Pakistan.” For the historian trying to understand the processes and discourses behind nationalism, Pakistani history textbooks and history-writing have become excellent avenues to study the official imagination of the state: an imagination that delineates national history and collective identity. In Pakistan, K.K. Aziz, has lamented the Murder of History, Mubarak Ali has put History On Trial, while M.N. Qureshi has asked Whither History? Along with several other historians they have highlighted the flagrant instrumentalization and twisting of history for the purposes of state ideology in an independent Pakistan. This article traces both the state’s construction of an imagined Pakistan, and the critical academic’s attempt to take this imagination apart. States like Pakistan try to conjure1 a homeland with a unique and bounded history and identity. To do so, they draw lines around what it means to be, and not be, Pakistani. This helps produce the citizen who, schooled in the history and identity of Pakistan, identifies with the state. In turn, the critical academic tries to question these boundaries of Pakistaniyat. Tired of the same old stereotypes? Support Tanqeed. A close look at official and academic discourses and practices reveals that one cannot speak of a straightforward success story of an all-pervasive national dogma. Even after Pakistan became a concrete entity, there was little agreement on e.g. Pakistan’s relationship to Islam, or the multiplicity of languages and ethnic identities. The debates continue today, as much in formal politics, as in the arenas of history and culture. It is these debates and their particular engagements with Pakistan that constitute one of the strongest arguments for retaining, rather than discarding, Pakistan Studies as a field. Even with the achievement of a distinct territory carved out for Indian Muslims, the ideological frontiers of Pakistan remained much more expansive than could be easily contained within the limits of a territorially bound nation-state. The two-winged form it took thwarted any easy cultural-geographic legitimation. It is clear at every turn that state efforts to create a coherent narrative and forge a national identity were faced with contradictions and tensions within the nation-state project of Pakistan. In an analysis of textbook history, Rubina Saigol shows how these projects were characterized in the 1950s and early 1960s by a “futuristic and modernist”nationalism that depended on a developmentalist image of the hardworking, industrious, upright and patriotic citizen, unbridled by narrow ethnic loyalties and parochialism.3 It was not until the 1965 war, and especially after 1971, that the subject-matter took on a more aggressively exclusivist and homogenizing turn, reaching its full bigoted form under the Islamization drive of the Zia years. Henceforth, there was an increased jingoistic preoccupation with the enemies within and without. Internally, the room for cultural, linguistic and religious pluralism shrunk, while externally, the Hindu/Indian became the epitome of the “Other”–reduced to a one-dimensional caricature that only existed in history as the conspirator, manipulator and conniver against the Muslim/Pakistani. Challenges to the official narrative are as old as Pakistan itself. The history of political contestation that the centralizing state has faced since its inception is mirrored in intellectual and popular milieus. These challenges have come from Left-oriented ethnic groups, labour and peasant movements, and, even, religious and Islamist groups–all of whom reflect the heterogeneity of life in Pakistani society. The story of contestation is the story of movements and political struggles led by people like Khan Abdul Ghaffar Khan in what was the North Western Frontier Province (NWFP), Maulana Bhashani in East Bengal, and G.M. Syed in Sindh. The on-going struggle in Balochistan, too, has a long history that goes back to 1947. The political writings, treatises, histories, poetry and literature inspired by movements such as these represent an entire alternate production of knowledge. Help us pay writers who don’t toe the line. Support Tanqeed. Similarly, the official narrative simply ignores female voices unless they fit neatly into patriarchal categories: for instance, Fatima Jinnah has a mono-dimensional role in Pakistan’s history as a loyal sister and as the mother of the nation (Mader-e-Millat). Such established tropes of female agency have, however, been challenged by a strong tradition of feminist literature by writers like Kishwar Naheed, Zaheda Hina, Fehmida Riaz and Ishrat Afreen. While these alternate visions certainly flourished and informed people’s lives, they, sadly, remained marginal when it came to informing scholarly engagement with Pakistan, be it within the country or elsewhere. The reasons are manifold: state repression, neglect of serious academic scholarship in Pakistan, and the marginality of vernacular languages, to name a few. The long history of multiple narratives and subaltern identities, and the rich corpus of sources that these present, are among the new avenues that emerging scholarship on the Pakistani context have begun to draw into the limelight. It is only in the last decade or so that Pakistan Studies has been taking on a new, academic connotation, especially within the country, gradually freeing itself from the shackles of nationalist dogma. Within Pakistan’s academic landscape, this has to do with the increased promotion of higher education that began under Musharraf’s regime. It has allowed departments of humanities and social sciences at Pakistani universities to look beyond established ideological boundaries. There has been a stark increase in funding, international collaboration and opportunities for Pakistani academics from diverse social backgrounds to study and work at universities in Europe and the United States. These changes have opened up the field to those without privileged biographies of private English-medium schooling. Pakistani universities, state-run as well as private ones, have entered networks of global academic debate and exchange, and are more integrated in the international political economy of academia. In my conversations with academics, I am beginning to discern a greater willingness to go back to Pakistan. It seems it is becoming more attractive and financially feasible for western-trained Pakistani and Pakistani diaspora researchers to work in Pakistan–they see opportunities to bring change in their home country without having to compromise on their academic careers. Furthermore, there has been an opening up of public spaces for debate (which also has its sensationalist downsides) with the proliferation of electronic media, a revival of civil society, and the spread of the internet, to name a few factors. It is from within this context that critical scholarly engagements with Pakistan emerges. Within the academy, Pakistan is situated within the multidisciplinary field of Area Studies, more specifically South Asian Studies, which has its own history of motivations, biases and exigencies, as explored by David Szanton in his book Politics of Knowledge (2002). The boundaries of ‘areas’as academic disciplines are a product of history. That is not to say that these boundaries cannot be intellectually productive, but it is nevertheless vital to be aware of their limitations as well as their potential. Just as Pakistan Studies within Pakistan has been shaped by state-control, so has international academic inquiry into Pakistan been delineated by the framework of South Asian–and Area–Studies. Most scholarship on Pakistan is concentrated in the United Kingdom and the United States. The tradition of studying South Asia in the UK is of course embedded in colonial history. In the US, it is related to the fact that this is where Area Studies emerged as a multi-disciplinary field, motivated by US-hegemonic aspirations during the Cold War. While Area Studies have grown and asserted their spaces of independence from the real political rationale that governed their founding years, there is a need to study the extent and nature of US influence on the directions and fields of Pakistan Studies. Ainslie T. Embree has written a brief survey of The Discovery of Pakistan in American Academia (2007) which traces this history and raises questions in this regard. Since its inception, Pakistan has been the subject of research in the humanities and social sciences within Area Studies institutes, departments, research centres and think tanks across the West. The ‘areas’covered range from South Asia to the more expansive Asia or the Orient. Not seldom, Pakistan is even to be found in the Middle East, as with the Center for Pakistan Studies [LINK: http://www.mei.edu/center-pakistan-studies] in the think tank Middle East Institute in Washington DC. As a field of knowledge production on the global stage, it remains fairly disjointed and poorly institutionalized, unless we talk about the trope of Pakistan as a ‘crisis state,’ which has inspired a consolidated field of inquiry in political science, security and policy studies, in particular from a US foreign policy perspective. [Final Work] Error iii, Eraser on paper, 22 x 30 inches. | Artist: Imran Channa, 2015, Lahore. At the forefront of the crisis discourse today are studies that feed into the post 9/11 international mainstream narrative, in journalistic accounts as well as academia, of Pakistan as a land caught in a perpetual circle of violence and radicalism, always on the brink of failing as a state. For instance, Stephen P. Cohen, a political scientist and senior fellow at Foreign Policy at Brookings Institution in Washington, in his last edited volume on Pakistan, Future of Pakistan (2011), approaches the existential dilemma of Pakistan, identifying problems and proposing solutions that could bring about a kind of Pakistan that would be in the interest of a stable world order and, more so, in the interest of the USA. The shelves of English-language bookstores in Pakistan are overwhelmed with titles such as Descent into Chaos, Pakistan at the Brink, or Avoiding Armageddon. These view Pakistan exclusively through the security lens, focusing on radical Islam, the ‘Af-Pak’region, and India-Pakistan relations. And while these studies certainly do not all tow a unified line–many, like Ahmed Rashid’s Descent into Chaos, are critical of US-Imperialist foreign policy–they nevertheless tell “a single story”of Pakistan, to use Chimamanda Adichie’s most succinct phrase. We want to tell another story about Pakistan. Help us. Already in the 1960s, scholars were looking at the shaky foundations of nationalism and the structural weaknesses of the state. For instance, in the 1967 The Making of Pakistan: A Study in Nationalism, K. K. Aziz writes about the multiplicity of imaginings and politics that underlay the idea of Pakistan, pointing to the myths of origin that make up Pakistani nationalism. Meanwhile sociologist Hamza Alavi’s works on the post-colonial state located in the Marxist tradition of the 1960s and 1970s, point to “the over-developed”post-colonial state. The events of 1971 present a break, in history and historiography, in terms of the “failure”that was now no longer avoidable but had come to pass. Immediate evaluations following the crisis of 1971 analyzed the failure of Pakistan in maintaining its sovereignty against Indian and Hindu interferences, its failure in building a viable state and its failure in nation-building. The debunking of the Two-Nation Theory brought about a more intensive engagement with what Pakistan’s relationship to Islam was: There emerged a concern with the tenuousness of Pakistan’s very origins. These evaluations point to the crisis of nationalism and the state. Ayesha Jalal’s Jinnah: The Sole Spokesman (1985) or Hamza Alavi’s (1983; 1988) theory of the “salariat”identify the origins of the crisis in the Muslim League’s lack of rootedness in the new territory. In contrast to such socio-political arguments, historian Farzana Shaikh in her book Making Sense of Pakistan (2009) represents an approach which emphasizes the realm of ideas and identity. She propounds that at the heart of Pakistan’s many crises lies one national identity crisis that is rooted in a historical “lack of consensus”on the role of Islam in the state. Saadia Toor in her analysis of the role of the Left in the contestation of ‘national culture’ in Pakistan6 flips Shaikh’s analysis of the crisis of nationalism around to view such debates as signs of a lively public political field rather than of ideological uncertainty. Similarly, Kamran Asdar Ali, in documenting the history of Communism in Pakistan (2015) in his new book, is concerned with reframing “Pakistan’s social and cultural history by presenting other possible imaginations for Pakistan’s future that were available in the country’s formative years.”((Communism in Pakistan: Politics and Class Activism 1947-1972. I. B. Tauris, 2015: 2. Print.)) Such a perspective on uncertainty and contestation uncovers new spaces and actors central to Pakistan’s history. This flip in perspective is representative of a trend in recent works on Pakistan which have been pushing boundaries of disciplines and thought. There has been a spate of scholarship concerned with “alternative politics”and “politics on the margins” that has emerged. For instance the collection of essays in Dispatches from Pakistan ((Tahir, Madiha R., Vijay Prashad and Qalandar Bux Memon, eds. Dispatches from Pakistan. Minneapolis: University of Minnesota Press, 2014: xiv. Print.)) wants to “account for the voices of the multitude”that negotiate in their day-to-day lives through the violence of the political, economic, gender and social hierarchies that they are embedded in. In these works, day-to-day life is not some realm where crisis is overcome by the force of “daily-ness”and habit, as if what is normal and usual can offset the negativity of Pakistan’s conditions of crisis. Rather, by looking for the “everyday”experience of crisis they contribute to a more holistic and differentiated picture of what informs the many conditions of Pakistan’s many subjectivities. It gives us an insight into how Pakistanis constantly re-define themselves, their communities, their aspirations, their fears, and their enemies. The everyday dimension, as theorized by scholars such as Michel de Carteau (1984) among others, allows the scholar to see the range of possible trajectories at every turn and makes it possible to move away from treating outcomes through the retrospective lens. FYI. We work for free. But our writers deserve to get paid. Help us. Such works are different from optimistic evaluations of Pakistan, such as Maliha Lodhi’s Pakistan. Beyond the Crisis State (2011). This genre of publications underscores the “strength and stability of its underlying social structure which enable the country to weather national and regional storms and rebound from disasters–natural and manmade [sic.]”. While these are refreshing rays of hope in the gloom-filled narrative scapes of Pakistanis, they do not actually “go beyond”the established repertoire of questions. They look to “explore the path to a post-crisis state” ((Lodhi, Maleeha, ed. Pakistan Beyond the “Crisis State.”New York: Columbia University Press, 2011: 2. Print.)) and thus approach contemporary Pakistan and its history from a macro-problem-solving perspective. It needs to be asked whether the predominance of this perspective is not foreclosing a more diverse and multi-layered inquiry into Pakistan’s state and society? The developments in Pakistan studies at home and abroad exhibit a slow but steady diversification of disciplines and fields within the study of Pakistan. In Pakistan much needed spaces of critical engagement are emerging at universities, in cultural centers and online. Themes of local, urban, and people’s histories and cultures dot the landscape of academic and cultural events. The last conference held by the Lahore-based five-year old forum THAAP was dedicated to the “Culture, Art and Architecture of the Marginalized and the Poor”and this year the theme is “People’s History of Pakistan.” This focus on margins and peripheries was also central to the academic conference “Locally Sourced in Pakistan: Recovering the Local in History, Culture, and Politics” that took place this August, 2015, in Islamabad. Similarly, academic events abroad are also critiquing the academic and journalistic discourses on Pakistan that view the country through the lens of Islamic fundamentalism and the “War on Terror”. The conference “Pakistan Beyond Tremors and Terror” from which the contributions have been published in a previous Tanqeed issue, critically engage with political, economic and cultural change by analyzing regimes of power as well as sites of resistance and subversion. What is conspicuous is the moving in of cultural and social history and anthropology from the disciplinary fringes of Pakistan studies, which had been overwhelmingly informed by political science and political history. But there remains a lack of consolidated fields within Pakistan studies with the potential to contribute more than mere empirical data and insular narratives. It is often the case that programs of a workshop or a conference cannot be too specific or else filling the ranks of presenters and chairs becomes difficult, a state of affairs that does not do justice to the complexities of a country of almost 200 million. It reflects the need of Pakistan studies for more institutionalized space where focused and critical conversations about Pakistan can take place that are at the same time institutionally integrated with social science and humanities. This can be places such as the Center for the Study of Pakistan at School of Oriental and Asian Studies (SOAS), London which was founded in 2011, the older American Institute for Pakistan Studies, or the many Pakistan Studies centers at universities in Pakistan that are cautiously exerting their independence from the ideological imperatives of state institutions. 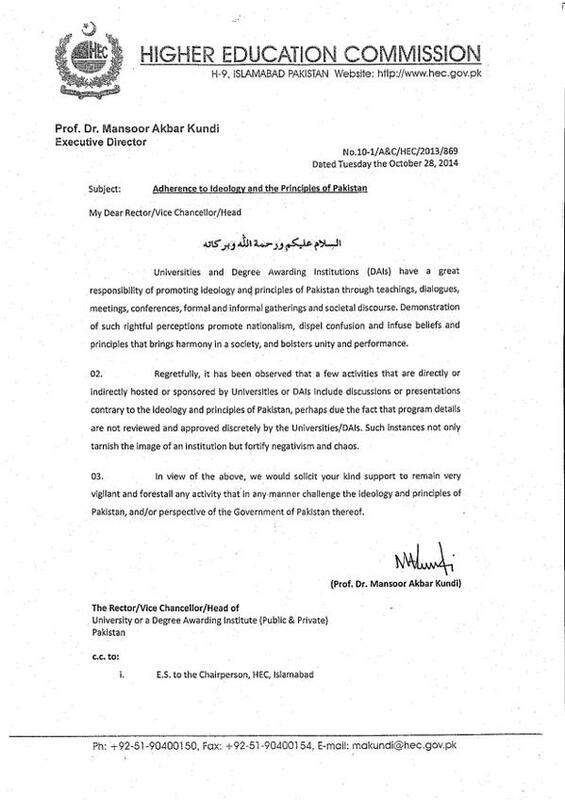 Such a promotion of Pakistan studies is not a “parochial”call opposed to the frame of South Asian Studies or one which seeks to insulate Pakistan in its specificity from larger disciplinary and theoretical debates. Rather it is a call to recognize that this might currently be the most useful route in terms of advancing the study of Pakistan within South Asian Studies and in established theories and disciplines, specifically, by the setting up of more distinct Pakistan Studies centers, forums and study programs. There is a need for assertion in the face of South Asian Studies being dominated–by virtue of sheer size but more so because of its vibrant academic terrain and the international interest in India as an “emerging economic power”–by scholars working on independent India. This applies especially to scholars in Pakistan and the kind of access they have to and audibility they have in the academic circles of South Asian studies on the global stage. Of course, India and Pakistan share a history and no amount of institutional boundary-drawing can or should separate the two. But Pakistan is no longer a nascent state. It has been a fact on the world map for almost seventy years and has, since 1947, lived and generated its own distinct history, which desperately needs to come into its own. It is in my view necessary to create a space for cultivating critical scholarship on Pakistan, in the country and abroad. There is also another motivation which I believe should drive us towards promoting Pakistan Studies. Pakistan Studies needs to find its place as a critical multidisciplinary field to correct the harm that has been done by its misuse for politics and ideology. A critical and self-reflexive Pakistan studies can help the emergence of a positive sense of identity and citizenship imbued with a sense for Pakistan’s heterogeneity–religious, cultural, and socio-economic. And last but not least, like Postcolonial Studies and the overarching Area Studies, Pakistan Studies carries a responsibility to challenge the inequitable global realities through activism on the battle field of knowledge production, empirical as well as theoretical. For Area Studies and the study of Pakistan within it, scholarship is intrinsically political and activist in its initial motivation: it is about counter-balancing the skewed power relations that define the conversations we are having. One of the critiques of Area Studies has been that it reproduces the exoticization that lies in colonial and imperial roots. Why do Area Studies only refer to the regions of the Global South, formerly known as the “Third World”? Are Europe and North America not regions like the rest? It is, in fact, the aim to overcome this division between“First World” and“Third World”that lies at the very core of the motivation behind the promotion of Area Studies and its explicit focus on the former colonized regions and societies of the world. Even today, theory in the social sciences and humanities overwhelmingly draws on the empirical contexts in the West. Meanwhile, the study of the “Third World”was for a long time relegated to the exotic and particularistic peripheries of authoritative Western academics. In the context of the rising Global South and the post-Cold War emergent multi-centric world, this state of the art becomes untenable. As Rehbein and Houben (2010) have argued, area studies have the potential to expand their theoretical horizons, while the social sciences need to do the same for their empirical frontiers. At a different scale, Pakistan Studies is fighting the same battle: to be taken seriously in producing theory. Sadia Bajwa is a Ph.D candidate in history of South Asia and research associate at the Humboldt University, Berlin. She is currently working on the history of student politics in Pakistan’s early decades. Alavi, H. (1983): Class and State. In: H. N. Gardezi & J. Rashid (Eds.) Pakistan: Roots of Dictatorship. London: Zed Press. Alavi. H. (1988): Pakistan and Islam; Ethnicity and Ideology. In: H. Alavi & F. Halliday (Eds.). State and Ideology in the Middle East. Basingstoke: Macmillan. Ali, Kamran Asdar (2015): Communism in Pakistan. Politics and Class Activism 1947-1972. London, New York: I.B. Taurus. Ali, Muabark (1999): History on Trial. Lahore: Fiction House. Ali, Tariq (1983): Can Pakistan survive? The Death of a State. Harmondsworth: Penguin. Aziz, Khursheed Kamal (1967): The Making of Pakistan. A Study in Nationalism. London: Chatto & Windus. Cohen, S. P. ( 2011): The Future of Pakistan. Washington D.C.: Brookings Institution Press. Embree, Ainslie. T. (2007): The Discovery of Pakistan in American Academia. In: Shafqat, Saeed (Ed): New perspectives on Pakistan. Visions for the Future. Oxford, New York: Oxford University Press. Government of Pakistan (1948): Proceedings of the First Meeting of the Advisory Board of Education for Pakistan, Karachi, 7th-9th June, 1948. Houben, Vincent & Rehbein, Boike (2010): Regional- und Sozailwissenschaften nach dem Aufsteig des globalen Südens. ASIEN, Vol. 116, pp. 149-156. Hull, Matthew S. (2012): Government of paper. The Materiality of Bureaucracy in Urban Pakistan. Berkeley, Calif., London: University of California Press. Hull, Matthew S.(2010): Uncivil Politics and the Appropriation of Planning un Islamabad. In: Khan, N. (Ed): Beyond Crisis. Re-evaluating Pakistan. [=Critical Asian Studies]. London and New Delhi: Routledge.pp.452-481. Jalal, Ayesha (1985): The Sole Spokesman: Jinnah, the Muslim League and the Pakistan Demand. Cambridge: Cambridge University Press. Aziz, K.K. 2004. Murder of History. A Critique of History Textbooks used in Pakistan.Lahore: Vanguard. Khan, Naveeda (Ed) (2010): Beyond Crisis. Re-evaluating Pakistan. [=Critical Asian Studies]. London and New Delhi: Routledge. Lodhi, Maleeha (Ed.) (2011): Pakistan. Beyond the “Crisis State”. London: Hurst. Marsden, M. (2010): Islam and Society in Pakistan. Anthropological Perspectives. [=Oxford in Pakistan Readings in Sociology and Social Anthropology]. Karachi: Oxford University Press. Quershi, I.H. (1962): The Muslim Community in the Indo-Pakistan Sub-continent (610-1947). Karachi. Pakistan Historical Society. Qureshi, M. Naeem (1989) Whither History? The State of the Discipline in Pakistan. In S.H. Hashmi (Ed.) The State of Social Sciences in Pakistan. Islamabad: Quaid-i-Azam University. Ring, Laura A. (2006): Zenana. Everyday peace in a Karachi apartment building. Bloomington: Indiana University Press. Saigol, Rubina (2006): “Ideology and Curriculum in India and Pakistan.”In Imtiaz Alam (Ed. ): History and Education in South Asia. SAPANA.2006. Lahore, pp.164-203. Shaikh, F. (2009): Making Sense of Pakistan. London: Hurst & Company. Sharma, Shalini; Kalra, Virinder (2013): State of Subversion. Aspects of Radical Politics in Twentieth Century Punjab. South Asian History and Culture, Vol 4, No. 4, pp. 435–442. DOI: 10.1080/19472498.2013.824685. Szanton, David L. (Ed.) (2004): The politics of knowledge. Area studies and the disciplines. Berkeley, CA, London: University of California Press. Tahir, Madiha R.; Memon, Qalandar Bux; Prashad, Vijay (2014): Dispatches from Pakistan. Minneapolis: University of Minnesota Press. Toor, S. (2011): The State of Islam. Culture and Cold War politics in Pakistan, London: Pluto Press. Yusuf, Huma (2013): City of Lights: Nostalgia, Violence and Karachi’s Competing Imaginaries. In J.S. Anjaria & Colin McFarlane (Eds) Urban Navigations. Politics, Space and the City in South Asia. Routledge. pp. 298-318. Zamindar, V. F. (2007): The Long Partition and the Making of Modern South Asia: Refugees, Boundaries, Histories. New York: Columbia University Press. This entry was posted on Mar 2016 at 12:01 AM and is filed under Borders, diaspora, Essays, Essays & Criticism, Issue 10: Borders/Boundaries, main bar, slideshow, Zine. You can follow any responses to this entry through the RSS 2.0 feed. Disqualified people have ruined our Pakistan. They all should be hanged. I like those pictures you’re post here. They are deeply emotional, as to me. Reminds of experiencing a hard life situation as it is. Good choice for the article. Well, that wasn’t an easy reading, but it was really detailed and clear, so I would like to thank you for your work! I like your article. Gread to read such ainformation and have some particular thoughts about that. Thanks a lot. It was a very interesting article, thanks for sharing this information. But I have something to add. Follow the link where you can find the full information about it. To tell the truth I really want to visit Pakistan. I think that it’s a country that deserves attention.